You will begin your guided walking tour at the Doge’s Palace, the seat of Venetian political power for centuries. Here you will hear the history of how the Duke and his council made decisions that controlled the fate of this thousand-year republic. Immerse yourself in the European Middle Ages and see the masterpieces that adorn the walls of the Palace. Relive the anguish of the prisoners that crossed the Bridge of Sighs and take the chance to experience the inside of the prison cell that hosted Giacomo Casanova during his time under arrest in the Doge’s Palace. After your guided exploration of the Doge’s Palace you will be taken on a tour of the inside of the Basilica of St. Mark’s. This Cathedral displays some of the finest examples of Byzantine art in the world, and is unique of its kind in Italy. Take in the beautiful golden mosaics and marble inlays of the floors as you listen to the history of the Basilica and have the biblical symbolism of the Cathedral’s art explained to you. Admire the Pala d’Oro, the high altar of the Basilica, decorated with thousands of gems and precious stones, and marvel at the religious art of the Basilica, collected over centuries. 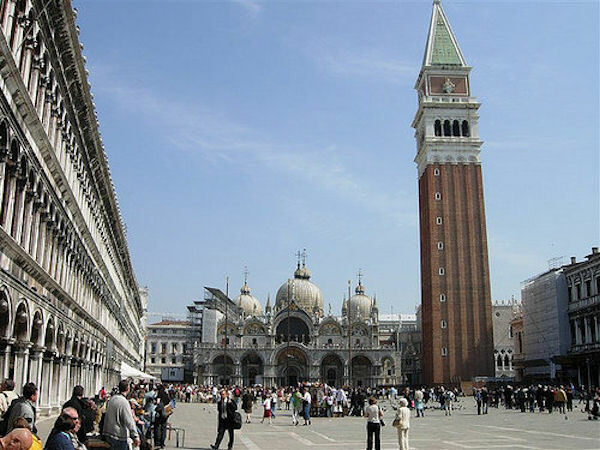 In collaboration with the Curia of Venice, this all-inclusive walking tour gives you the chance to experience the historical landmarks of Venice on a guided tour and walk around this unique city. You will have privileged entry to the Doge’s Palace and Basilica of St. Mark’s, as well as a Curia educated tour guide to lead your experience. Avoid the queues, immerse yourself in the history of Venice, and make the most of your visit to this remarkable city. Remember to bring your camera. Please note you will need to buy a ticket for the people mover for 1 Euro each way to arrive at the meeting location.